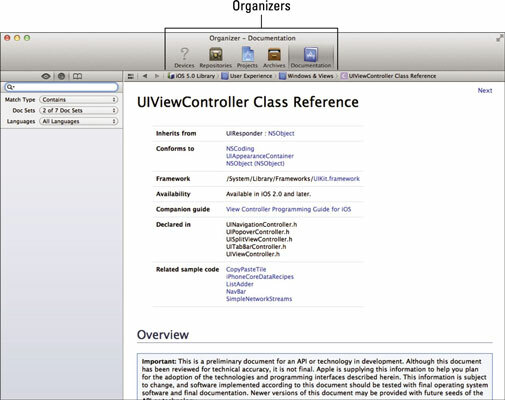 The Organizer window in Xcode (shown in the figure) enables you to do the supplemental tasks associated with development, such as accessing documentation and managing devices, archives, and project-related metadata. Devices organizer: Provision a device, manage your developer profile, install iOS on the device, and manage your application and data on a device. Repositories organizer: Create, view, and manage Git and Subversion repositories for your Workspace. These are where your various project versions are managed. Projects organizer: Lets you locate your projects without having to remember where they are in the file system) and offers snapshots — a Save feature that enables you to save different versions of your projects). Archives organizer: Submit your application to the App Store or testers and manage your product archives. Documentation organizer: Access documentation and sample code from within Xcode. Each of these organizers includes task-oriented contextual help that you get by Control-clicking an organizer’s content pane.